Yeap…another fig recipe. Sorry, but I still am harvesting the sweet beauties and this new recipe is my favorite dessert to bake right now. A delicate and not overly sweet treat. My figs are small so I used like 14-16 of them, at least! But use store ones if you don’t grow them and if they are big; cut the figs in thirds. It goes together pretty quickly if you use your stand mixer to blend up the pastry crust. My old recipes used goat cheese but cream cheese is a less tangy choice and reminds me a bit of cheesecake. I softened my cream cheese in the microwave. Don’t worry if there are some tiny lumps in the filling after beating but do soften it close to room temp for best blending results. One time I used an egg wash on it and one baking version I didn’t. More sugar sticks onto the crust if you use the egg wash. Just saying it helps but if you don’t want to you can get away with not doing that step. Line a 15 inch pizza pan with parchment paper. Can use a thick cookie sheet; preferably with edges. Done it both ways. Mix dry ingredients in bowl of stand electric mixer. Add butter and mix until crumbly and resembling coarse meal. Add egg and juice. Mix until it comes together into big chunks. Shape into a ball with your hands. Put it on a crust sized piece of wax paper (14 x 14 inches more or less), flatten the crust ball some; put on top of it another piece of wax paper and chill it all in your fridge 15-20 minutes. 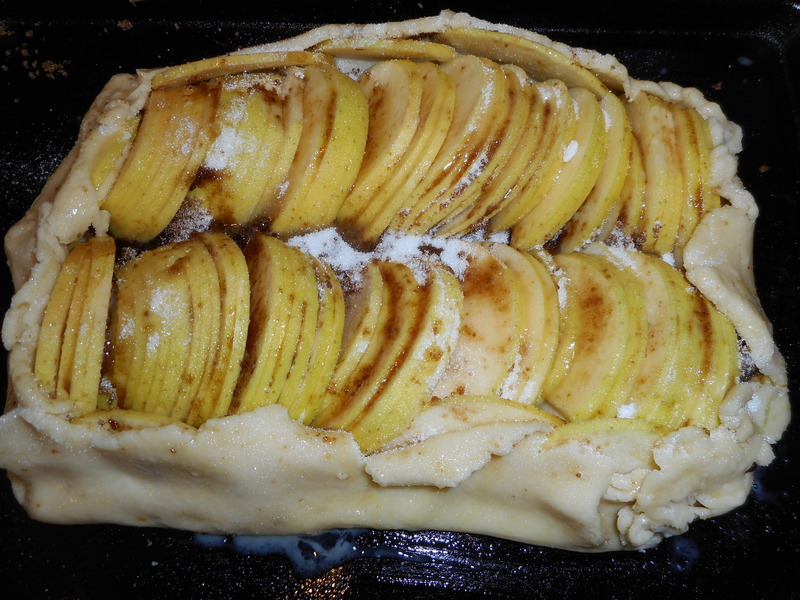 Then roll out and put on the parchment lined pan; put back in the fridge while you prepare the filling. You can make this crust and refrigerate it for hours or a day; will need to warm up for a bit before rolling out. Get it out first and let it stand a bit. No microwaving though! Directions: Cut your figs into halves or if large, thirds or quarters. Cream cheese filling: put softened cream cheese in medium bowl. Add brown sugar, cinnamon, optional nutmeg, lemon juice; blend with whisk, add egg and blend well. Zest the lemon with either a fine grater or better yet a loop zester that will give you longer strands. I like to do it onto a sheet of wax paper; add to well blended filling. It is smart to zest your lemon before you want to juice it for the filling and crust. If you have time chill the filling for 10-15 minutes before compiling the tart. Get out the tart crust and pour the cream cheese filling in the center. Leave 1.5 inches of plain crust around the edge, put fig halves gently all over the cheese filling, cut side up, leaving no big gaps, not touching them but with a bit of filling between them. Fold up the edges of your crust and pinch together to create the galette shape. Try not to let it crack at the bottom; pinch and fix those cracks! Use a pastry brush to brush the crust with the egg wash. Sprinkle the coarse sugar over it all including the crust. Bake for 35 to 40 minutes in a 375 degree oven. The crust should be lightly browned and filling almost bubbling. Let your tart rest a bit; don’t serve hot but a warm slice will be awesome. Slice and top with a big dollop of crème or yogurt if you like that sort of thing. We ate it plain – which is actually my favorite way to appreciate the flavors of this awesome tart. I am wondering if coffee ice cream might go great here… Enjoy! The crust recipe is from Annalise Roberts great cookbook, GF Baking Classics, Second Edition. If you don’t have enough apples for a pie or the time necessary for that project you can make this quick and delightful free form apple galette. I made it round but you could go oval. It only takes 3 apples and no need for a top crust. It is the same crust I always use but I did leave out the sweet rice flour which gave it a bit more firmness; up to you whether you use it. Please use Granny Smith; you need a firm baking apple that will hold its shape for a long bake. You could leave off the sprinkle of coarse sugar but why? It adds a great crunch and looks perfect; finishes it just like a bakery might. This might be my favorite new dessert; easy, low on the sugar and oh so delightful. Still, you could use less sugar if you want; maybe cut to a third of a cup. I used organic sugar and I think it made it taste just a tiny bit better for that! Line a 15 inch pizza pan with parchment paper. Can used a thick cookie sheet; preferably with edges. I used my silicon sheet cover but frankly it got all covered with dark brown hard sugar from leaks; a pain to clean it; go with the parchment paper! Mix dry ingredients in bowl of stand electric mixer. Add butter and mix until crumbly and resembling coarse meal. Add egg and juice. Mix until it comes together into big chunks. Shape into a ball with your hands. Put it on a crust sized piece of wax paper (14 x 14 inches more or less), flatten the crust ball some; put on top of it another piece of wax paper and chill it all in your fridge 15-20 minutes. Then roll out and put on the parchment lined pan; put back in the fridge while you prepare the filling. Directions: Peel apples, cut in quarters, remove cores, cut each quarter into 3 or 4 slices. Place in a large mixing bowl, sprinkle with lemon juice. Mix the dry ingredients in a cup; pour over the slices, toss with a big spoon; sprinkle with the zest. Get out the tart crust and sprinkle it with the white rice flour, just in the area you are going to lay out slices; not the edges. Then lay out the apple slices in a big circle0 Leave 1.5-2 inches of crust around the slices, put slices in the center too. One layer only.. 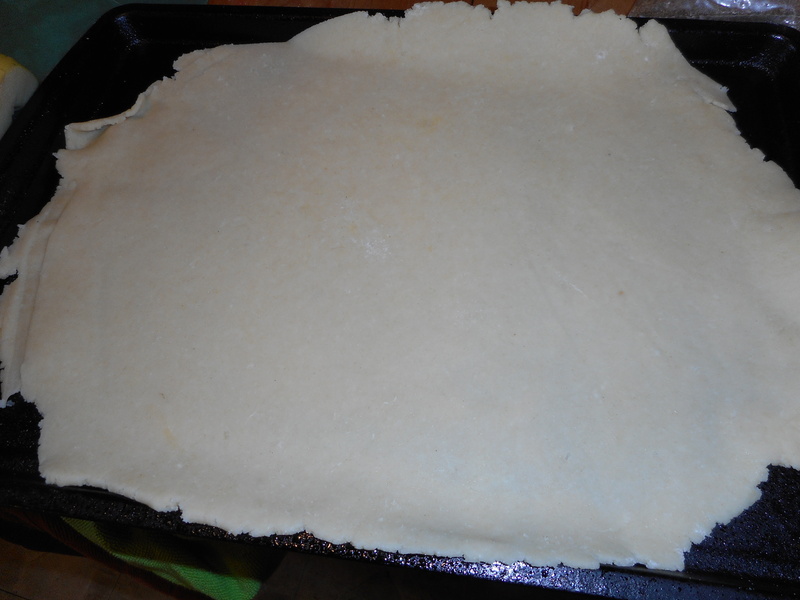 Fold up the edges of your crust and pinch together to create the galette shape. Try not to let it crack at the bottom; pinch and fix those cracks! Use a pastry brush to brush the crust and fruit with the egg wash. Sprinkle the coarse sugar over it all including the crust. Bake for 50 to 60 minutes in a 350 degree oven. The crust should be lightly browned and filling bubbling. If sugar leaked out just break off the brown bits before serving. Let your tart rest a bit; don’t serve hot but a warm slice will be awesome. Slice and top with a big dollop of crème or yogurt if you like that sort of thing. We ate it plain – just my favorite way to appreciate the flavor and texture of this awesome tart. Enjoy! I used my favorite gluten free crust recipe plus some cinnamon. This crust never fails to impress; it is flaky and tender. Never tough or too buttery. Sweet juicy figs are the bomb! Finally, the herbed goat cheese added an intriguing slightly savory flavor to the overall taste. A big slice was just delicious with a glass of lemony iced tea. Enjoy! Line a 15 inch pizza pan with parchment paper. 2 oz light or regular cream cheese, room temp. Directions: Zest a small lemon. I do this onto wax paper for ease of picking up later. Use some of the juice for the crust. You can leave the zest out if you are not a big fan. You do need the juice in the crust; can use fresh squeezed OJ too. Get out the tart crust and roll out to a large circle. Place on the parchment paper; I unpeeled one side of the rolling plastic and flopped the whole thing onto the parchment and then peeled off the other side of plastic leaving the crust on the parchment. Blend the goat cheese, cream cheese and honey using a whisk. Add half the beaten egg, beat some more until well blended Spread the mixture out on the crust. Leave 1.5-2 inches of crust around the filling. Top with halved or quartered figs; mine were small; halved them, cut side up. Fold up the edges of your crust and pinch together to create the galette shape. Use a pastry brush to brush the crust with the remaining egg wash. Sprinkle the sugar crystals over the crust and some on the figs. Bake for 30 minutes in a 400 degree oven. Sprinkle the lemon zest on before you bake it or half way through the baking. Let your tart rest a bit on a cooling rack; don’t serve hot but a slightly warm slice will taste amazing. It was still great the next day although the crust wasn’t quite as crisp due to high humidity. Enjoy! Figs are a favorite of mine in the fall. Pricy though. This year my fig trees came through with several dozen figs over about a months time. Some were stuffed with goat cheese and drizzled with honey, and eaten raw. Some were roasted briefly with that same yummy cheese. Heavenly. A lot were just popped in my mouth for a sweet treat. I made a super delicious fig and yogurt cake last weekend. Now for a fig based dessert in the pie family. Saw this recipe on Tasting Table a while ago and immediately knew I just had to make it. FYI: a galette is a free form flat round French tart. Now you know! I used my favorite gluten free crust recipe plus some cinnamon. Lacking almond paste I made some; see my blog post for that recipe: https://myworldwithoutwheat.wordpress.com/2014/12/24/almond-paste-holiday-joy/. The filling was fairly close to the recipe. You might think the thyme leaves and honey unusual but trust me it is just perfection! If you love figs or raspberries this is an outstanding and show stopping dessert. Directions: Combine the almond paste and sugar in a small food processor, process until broken up into sandlike mess. Add the butter and process until blended. Add flour, egg, brandy and salt. Process some more. Chill in fridge while you continue tart creation process. Chop the thyme (remove all stems). Zest a tangerine or half an orange’s skin. I do this onto wax paper for ease of picking up later. Get out the tart crust and the almond mixture. Spread the frangipane out; I just dumped mine in the center of the crust and it spread on its own. Leave 1.5-2 inches of crust around the filling. Top with halved or quartered figs; mine were small; halved them. Next sprinkle the raspberries around; I didn’t need the full 6 ounces. Sprinkle on the sugar, thyme leaves, then drizzle with honey and dust the zest over it as evenly as possible. Fold up the edges of your crust and pinch together to create the galette shape. Use a pastry brush to brush the crust with the egg wash. Bake for 30 minutes in a 425 degree oven. Mine got a little too brown on the bottom. Next time I will turn it down to 400 after the first 15 minutes. Let your tart rest a bit; don’t serve hot but a warm slice will be awesome. Slice and top with a big dollop of crème or yogurt. I liked how it looked: the shape of it and all those skinny slices. What the heck is a galette? I goggled it and the term can refer to a French free form cake or a free form tart that is sort of between a pie and a tart. It should be less work than a pie or a fancy tart. This one is a rectangular shape which I loved. Not that tough to shape. You can do it. The hardest part for me was spelling the word correctly for this post! 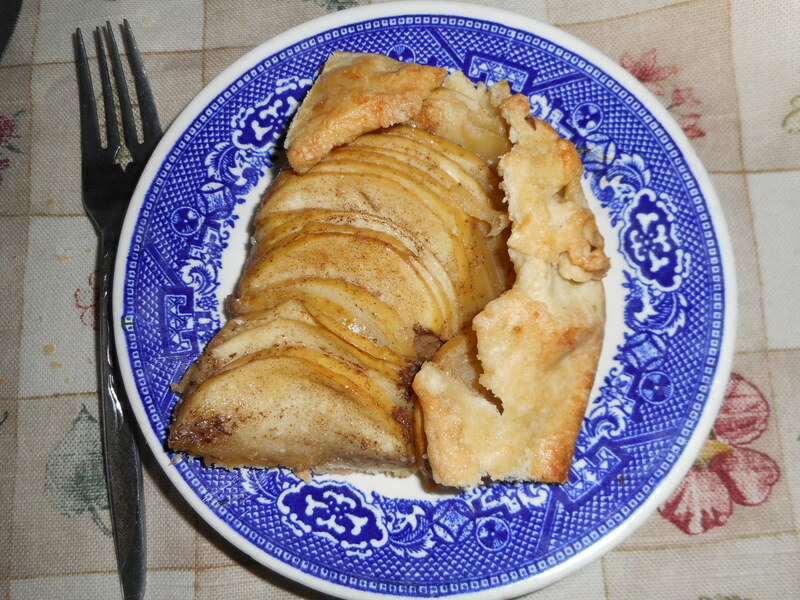 Anyway, my apple galette was easy to make and gorgeous to look at and even tastier to eat! Impress your family when you toss this together – they will think it took hours to make. Leaving the skin on the apples makes them easier to slice thin, they hold their shape better and you save time. Plus you get the bonus of all the fiber and nutrition of the apple skin and right below it. 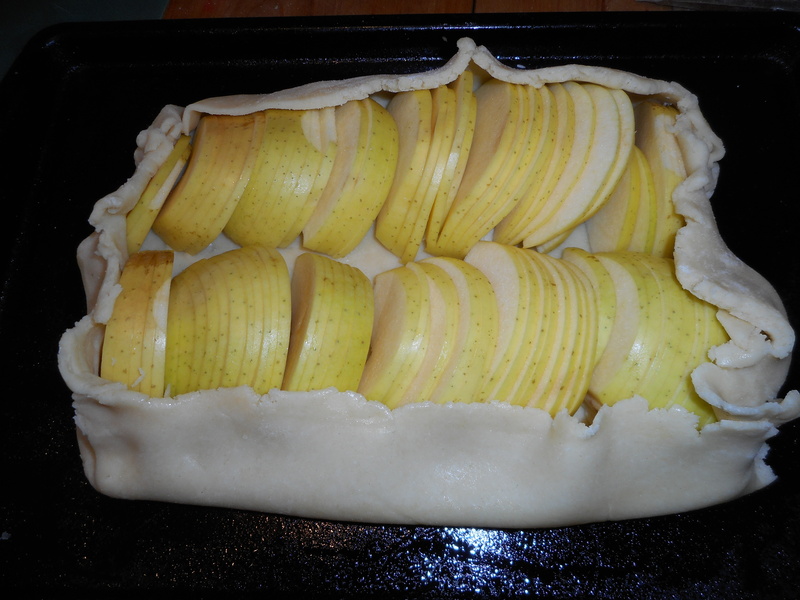 First, make the crust and chill it a bit while you slice the apples. Baking pan: Spray 10 x 14 inch metal baking pan with cooking spray, dust with white rice flour or line with parchment paper. Take 2 tbsp. salted butter and heat it in a sauce pan until it is browned, watch closely or it will burn. Pour it into a small bowl to cool a bit. It will brown a touch more even out of the pan so take it out at a medium brown. Wash and dry three firm cooking apples. I used golden delicious that I bought at an orchard store; Bechdolts Orchard to be exact. Apples are extra fresh when you get them from where they grew. I cut them in half and cut out the core with my knife. I put the cut side down and cut the apple half into skinny1/8 inch slices. Leave them all close together still shaped like an apple half. Cut them all like that. I ate the end pieces that were rounded or otherwise less than perfect! Roll out the somewhat chilled crust between the two sheets of wax paper into a rectangle; about 10 by 14 inches, try to get the thickness even, no thick middle! I use my pie bag as it works great even for weird shapes. Peel off one side of paper and place on pan, centered. Remove other slice of wax paper. 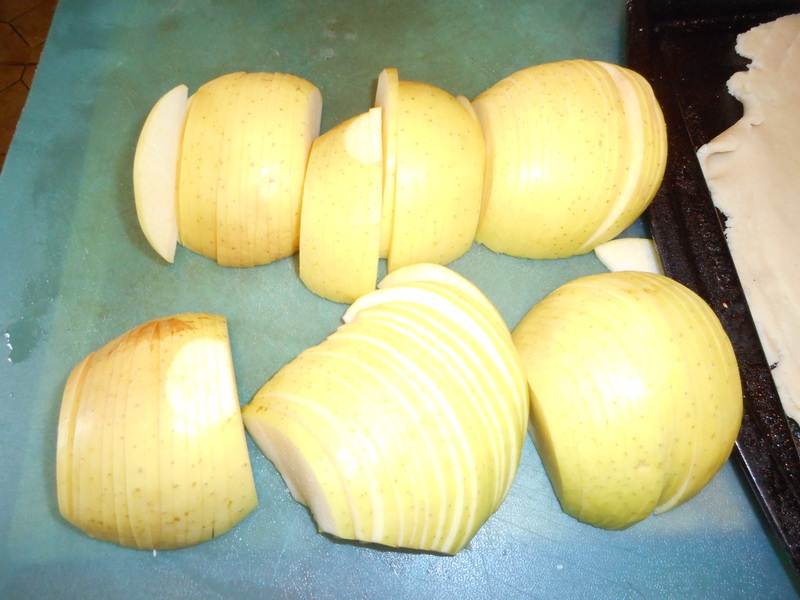 Place your skinny sliced apples skin side up, separating them slightly. I made two long rows and put a few slices down the sides. Leave a 1 ½ inch border of crust untouched all around the fruit. Pour the brown butter all over the fruit. Sprinkle with the dark brown sugar. Fold up the border of dough to form rustic sides; connect at the corners, no need to make it perfect; it is a galette! Beat the egg well with a small whisk and add the water. Brush the entire tart shell and fruit with it. Sprinkle with that spoonful of regular sugar. Bake in a preheated 375 degree oven for 40-50 minutes until bubbly and the crust is light brown. Cool at least 15 to 30 minutes before serving. I served mine with the time honored tradition of vanilla ice cream, my favorite: Turkey Hill’s homemade variety of vanilla. It was also delightful all by itself so you can savor the delicate flavors of the apples with the brown butter and brown sugar. The original recipe had some fancy whipped cream flavored with a couple of tablespoons of maple syrup; next time! And there sure will be another apple galette this fall. It was tasty and I loved the extra crunch the crust had from the painting of egg wash and sugar. My pie crust has never been put to better usage nor had better flavor. 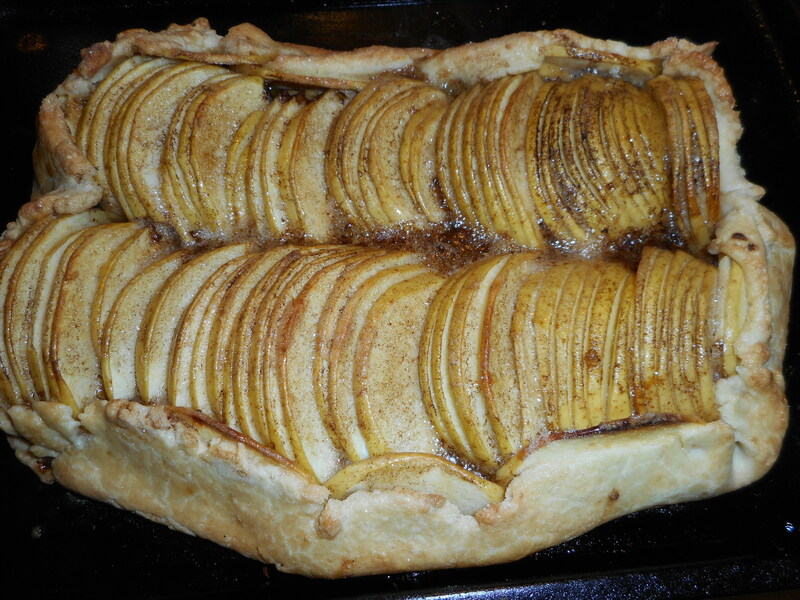 We had this for lunch today; made with empire or cortland apples; absolutely delightful. I put 1/2 tsp. cinnamon in the crust before adding the egg. And I used big crystal sugar for the topping tbsp. of sugar. Even better than last time I made it.